A framework is like the blueprint of a building that guides the construction of the remaining details. In social sciences it is a conceptual structure of a social phenomenon such as entrepreneurship and negotiations to name a few. The more abstract and generic the framework the more diversity can afford in explaining reality. It’s like the laws of physics – the simpler the formula the stronger it is or the less exposed it becomes to external scrutiny. The truth couldn’t be stronger in negotiations and especially e-negotiations. If one can consider the width and breadth of what we are negotiating it could include every single decision we make in our lives. From whether to take one route over another to save time, to speak or stay silent, to whether we will sign an email with just our first name or our full affiliation, and finally in our case to closing a business deal—it’s all about negotiating things we value. So what can it be more natural than negotiating? A generic framework could help someone build awareness (as a first step) to how we should approach negotiating with others. A problem solving approach will take someone through the phases of intelligence and perception, followed by strategy and communication. This is more or less the rational approach to solving any kind of problem in sciences and everyday life (Figure 1). When an issue arises and registers in our senses, the first thing we do is to organize the various bits of information and correlate them with related pieces in our memory. Their affinity with our past will help us make sense of what they mean, plan our actions, and finally implement them. Based on the response we get, we repeat the process until we finally reach a satisfactory resolution or walk away. We then move to the next challenge and we go on in life trying to optimize our path. Efficiency and effectiveness shape our learning and guide our future approaches to problem solving and negotiations. With certain types of negotiation we encounter frequently or with a case with which we are familiar, we might spend very little time in intelligence, perception, and strategy and early on go to the communication phase where we will spend most of the negotiation time (Figure 3). This is a natural and expected move, but we should occasionally reflect on the suitability of our applied strategies even in routine negotiations since exceptions might appear that require additional consideration. The transitions between phases can vary in speed and while sometimes it may appear that we jump phases, we do actually go through them nevertheless. Even, for example, when we have all the information in advance, it is unlikely that we will formulate a strategy unless we reassure ourselves that the facts are the ones we have and nothing more (meaning we go through to the intelligence phase) and that we understand and interpret their meaning correctly (meaning we then pass onto the perception phase). Similarly, it is unlikely that we will communicate something without first ensuring it is aligned with our intended strategy: having said that, we should keep in mind that just because we follow such a process, it does not mean that individual elements are rational. Optimization of skills is a completely different issue and has to do with our abilities, our experience, and the situation at hand. As one would have probably figured out by now, nothing is really written in stone. Understanding, flexibility, and good judgment will help negotiators choose their approach and strategy specific to the issues they are facing. E-negotiations are no exception to the way we traditionally approach them at least from the perspective of a framework. A major advantage of e-negotiations is the ability to record every detail of the communication process including intentions, outcomes, and information exchanged. This can provide a better understanding of the negotiation process and behavior and allow analysis and evaluation of strategies that would be impossible in face-to-face negotiation. On the other hand, the resulting time lag from the asynchronous communication exchange has been shown to make negotiators pay more attention to the substantive content of messages, and has lessened the emotional stress brought about by conflicting positions and made it easier to overcome socioeconomic differences. Another important aspect of e-negotiations is the reduction of communication cues. According to the situation or the adopted strategy, this can act as an advantage or disadvantage. Inability to observe body language, facial expressions, and tone of voice may assist in focusing on the issue at hand, but it can also lead to misinterpretation, frustration, and mistrust. Negative emotions seem to be more influential in online negotiations than in face-to-face situations; but at the same time the faceless world of online communications appears to allow freedom of expression that would otherwise be hindered offline. Research seems to indicate that as individuals become more familiar with the Internet and they use it in their daily communication, they tend to apply the same values as they do with other communication mediums. After all, a world is a “world” whether real or virtual since we function on past experiences that we carry from the physical world. To convey feelings and emotions online in an attempt to avoid misinterpretation and get our point across, a form of language in terms of symbols and norms have come into use through general acceptance: symbols like ‘smileys’ can be used to magnify and express feelings of text-based information, while switching from lower case to upper case can be used to emphasize text—an act similar to shouting in the physical world. Time, data, and location tracking along with direct request and translation services can further assist in clarifying the content that is being communicated. Individuals disadvantaged by geographical location, confinement, threats, mobility, and sight or hearing impairment can now use the Internet to access information and negotiate on equal terms. The virtual environment nevertheless brings its own unique hierarchies and “social” structures. The privileged ones can have fast access with state-of-the-art hardware and software, while the less privileged will be on the other side of the “digital divide.” Typing speed and fluency with English can also be a divider in that the fast typists and native speakers can easily keep up in chat rooms and intense communication exchanges. Intelligence: In online negotiations this stage involves many aspects with primary the ability to profile a situation, individuals and organizations with extreme ease providing quality results and strong leverage to efficient users of medium. The data evaluated when profiling a person online include pictures, videos, and text they developed or others produced about them. The data evaluated when profiling a person online include pictures, videos, and text they developed or others produced about them. Pictures will reveal most of their genetic characteristics and provide snapshots of their interaction with the world. Videos will additionally reveal changes of behavior in social settings. Even looking at a seemingly meaningless video of your subject (attending an event, for example) can offer valuable clues about your subject’s psychological and social profile. Profiling organizations is much easier simply because organizations are legal entities that need to keep public records of their activities, have identifiable internal structures, and need to interact with their environment though rules and procedures that are more or less standard. Having all that information about organizations and combining it with their past and present policies and actions, we can more precisely predict their perspective on negotiation issues. With the advent of the Internet, nowadays it is easier than ever to locate information about organizations, especially large public and private corporations which store a multitude of data on the Internet. Perception: This is a follow-up phase where and critical element in e-negotiations primarily because of the lack of visual social cues found in face-to-face negotiations. Perceptions are based on our subjective judgment. They directly impact the way we communicate, form our strategies, and plan our actions. Our cultural norms and values, whether familial, social, ethnic, tribal, religious, or regional serve as our reference point in conducting negotiations. Perceptions can be seen as transformations of information to knowledge after it’s filtered through four generalized layers (Figure 4). 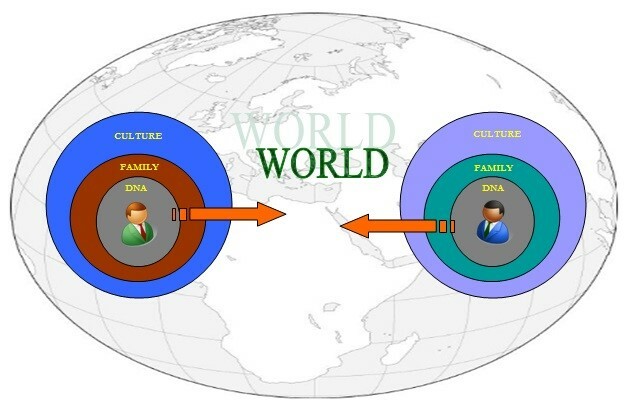 These layers encase: 1) inherited personality and intelligence (DNA imprinting); 2) environments where we grew and matured and that conditioned us to certain beliefs and values; 3) the society we live in that imposes cultural traits in us; and 4) the world at large with its global economic, social, and political trends. All these layers affect the messages we send and receive. The major activities that penetrate and guide our perspective and being-in the world is education and the personal experiences which influence personal style and build intellectual abilities and coping skills throughout our lifetime. When conducting e-negotiations, perception is primarily affected by lack of sensory data and especially the visual stimulus we are so much dependent on. By nature we are creatures that rely heavily on vision since it allows us parallel processing of information. While the acoustic signals are processed one at a time, our visual cortex is designed for processing visual signals from many sources. This is why it is easy to make sense of a picture of a crowd while it is difficult to make sense of it by listening to everyone speaking together. What we lack in information online, we replace with imagination, especially when it comes to forming perceptions of others. This can range from idealistic images of our counterparts to cold realism with its illusion of objectiveness. All interpretations are based on extrapolations of past experiences and knowledge we acquired in our lives. While this serves as a good first estimate, the inherent generalization of our assumptions might miss the different reality that each situation expresses. Mutual invisibility in e-negotiations can facilitate adversarial, contentious, and trust-breaking behavior. Denial is stronger when damaging a faceless other, particularly when we feel protected by a shield of anonymity and physical distance. This sense of anonymity and distance can lead negotiators to assumptions that they won’t be accountable for the social characteristics of their behavior and as a result they can freely engage in aggressive or trust-breaking behavior. Strategy: E-negotiations offer certain strategic advantages that do not exist in face-to-face negotiations, like the opportunity for in-depth intelligence and analysis before initiating the actual communication. They also allow for more reflection during the process as time in most cases is not of direct influence. These aspects of present day negotiations, combined with the fact that negotiation behavior can often be deduced by the strategy used, offer great opportunities for solutions that can be quite rewarding and lasting. Effective negotiation requires a coherent framework linking means to ends. Identifying the fundamental interests and limits of all the parties and assigning values to them is a very important step. Careful negotiation analysis is also important to identify possible barriers to agreement, as well as structural elements that might be optimally rearranged to provide insight and gains during the negotiation process. All these may additionally reveal important moral and ethical issues as well. A progressive shift from a situational to an institutional view of negotiations may represent a radical change that organizations need to seriously consider in the “information era” in which we live. This will directly impact how negotiators conduct themselves and force radical changes in the way they perceive negotiations. A carefully planned approach with emphasis in communicating the rationale and benefits of the new approach might be all that is needed. As long as the overhead created by a formal approach to negotiators doesn’t overload them, distracts them from their work, or alters their behavior, radically organizational success in that issue is almost certain. E-negotiations by their very nature lend themselves to such change in mind frames since they free organizational resources related to face-to-face negotiations. In addition, a lot of the formalities that might be required in the form of reporting might be easier to make since everything is more or less in some form of documentation already. In the online world it is a lot easier to provide support to negotiators in the form of case studies and training that the negotiators can customize to their own individual needs. Based on the personal and professional “age” of their workforce, organizations should observe a gain n productivity by institutionalizing negotiations. With more effective and reactive negotiators, companies will reap the benefits of closer and more rewarding relationships with suppliers, customers, and their partners. Communication: In all communication modes and mediums, one should capitalize on their advantages and be aware of their limitations. The correct choice and combination of communication modes could be a strategic decision and dependent on the issue at hand. Our focus here will be on e-negotiation modes that are frequently used and will be used in the near future like telephone and teleconference, videoconference and email, while briefly mentioning science fiction style modes like virtual reality, among others. The basic communication mediums that we present here facilitate and can project some form of social cues (empathy). Their main advantage is that they overcome geographic distance and widely function irrespective of environmental factors (hot or cold, snow, rain, and so on). Communication is a vital process in e-negotiations as it is the means by which we exchange offers and counteroffers along with their supporting material. The process is effective and complete when the receiver of the message has understood the meaning the sender intended to convey. It can span distance and time, cross nations and cultures, and use different mediums for message transmission. It can involve text, speech and visual representations, and involve expressions of emotion like body language, facial expressions, and paralanguage. Negotiation strategies have been identified in the literature ranging from distributing, avoiding, accommodating, integrating, compromising, collaborating, and exploiting, to competing, among others. Naturally, negotiators don’t necessarily belong in exact stereotypes, but the general rule is that if the spiral doesn’t progress in the intended fashion then there is something seriously wrong in the negotiation. Competitive negotiators tend to spend more time in the last phases of positioning and communication while cooperative ones spend more time in understanding the opponent and position accordingly. From the point of view of the suggested framework, the suggested spiral will more than cover the e-negotiations process while allowing the individual to employ their own personal style by acting on the time length of each phase. The communication mediums employed today include teleconferencing, videoconferencing, and web-based communication. It should be taken as a certainty for the future ahead of us that e-negotiations and the technology supporting them will create new and unique advantages and disadvantages. The absence of traditional social cues and their substitution with new forms could lead to more objective evaluations, while also diffusing identity perceptions and lessening self-awareness. On the other hand, communicating through the Internet defies logistic boundaries of time, place, and hierarchy, and allows focused considerations of task content and performance.